This publication is for Law Enforcement only. With gripping re-creations, law enforcement's most popular writer on survival tactics takes you inside more than 20 unforgettable confrontations where officers' lives are on the line. How do the threatened officers meet the challenges suddenly thrust upon them when a normal shift or a tranquil off-duty moment turns in a flash into a fight for life? What "blood lessons" do they learn from their ordeals that will help you survive? Here is police work in his rawest, deadliest form. Ask yourself: "What would I do?" 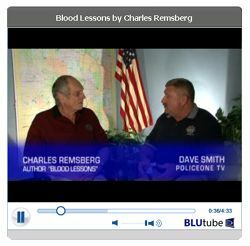 Check out the EXCLUSIVE PoliceOneTV Interview, where author Charles Remsberg gives us a peek at the making of his newest book, Blood Lessons. Audio Sample 1: In this audio excerpt from Blood Lessons, Charles presents one officer's trial by fire. In the book, you can read the lessons this officer and more than 20 others want you to know for your own survival—lessons they learned the hard way, at the raw edge of law enforcement.